Since clearing waivers and accepting an assignment to the Isotopes in August, Elbert allowed seven runs, 14 hits and three walks in 7 1/3 innings while striking out six, but that was skewed when he gave up five runs while getting one out at Las Vegas on August 8. From August 14 to the end of the season, Elbert pitched 4 2/3 shutout innings with five strikeouts. As you'll recall, Elbert was the Dodgers 1st round draft pick in 2004. He had originally been drafted to be a starter, but like so many high-flying prospects the bullpen soon became his calling. In 2011 he finally solidified himself as an integral part of the Dodger relief staff - as our lefty specialist. That season he pitched in 47 games, allowing just 9 earned runs over 33.1 innings and saved two games. He also struck 34, walked only 14 and left-handed batters hit only .191 against him. The next season he pitched in 43 games but regressed a bit - left-handers batted .271 against him. Unfortunately, arm problems that began with shoulder issues that caused him to miss most of the 2007 season continued to plagued him. His 2012 season was filled with several trips to the DL and finally ended with surgery in mid-September. Then, a setback resulted in another surgery several months later in January 2013. By mid-year he looked ready to go again, but pain emerged in his elbow after pitching on consecutive days in rehab. So on June 10, 2013 he had Tommy John Surgery. Just over a year later Elbert returned to the mound and has been working on getting back into game shape. I don't know if we should expect much from him, but it'll be nice to have another experienced lefty arm in the bullpen. Just as a reminder, Elbert throws a low 90's four-seam fastball and a high-80's slider. He also uses his slider as his out pitch. It'll be interesting to see if some of the zip he used to have is still there. In celebration of Scott Elbert's return to the Dodgers I made the above fantasy card for him. I used a photograph grabbed from Dodger photographer Jon SooHoo/LA Dodgers 2012 and the 1971 Topps Baseball card design. Follow up on yesterday's post featuring the Dodger base cards found in Topps 2014 Triple Threads packs, I now share the various relic cards that are available. Go here to check out all of my post post on this set. First up are the scarce All-Star cards. Most of these are "1 of 1's", with exception of the card directly below. That card is an All-Star Patch card and they are limited to only 9 copies. There is also a ruby parallel card numbered to only 1 copy. BTW, only Clayton Kershaw is featured. Yasiel Puig, even though he was on the All-Star team, is not available. Three All-Star Book Clayton Kershaw booklet cards have yet to be unearthed. They are the All-Star Jumbo Sleeve Patches Book Set (1 of 1) #AJSP-CK, All-Star Jumbo Sleeve Team Patches Book Set (1 of 1) #JSTP-CK and All-Star MLB Logo Patches Book Set (1 of 1) #AMLP-CK. 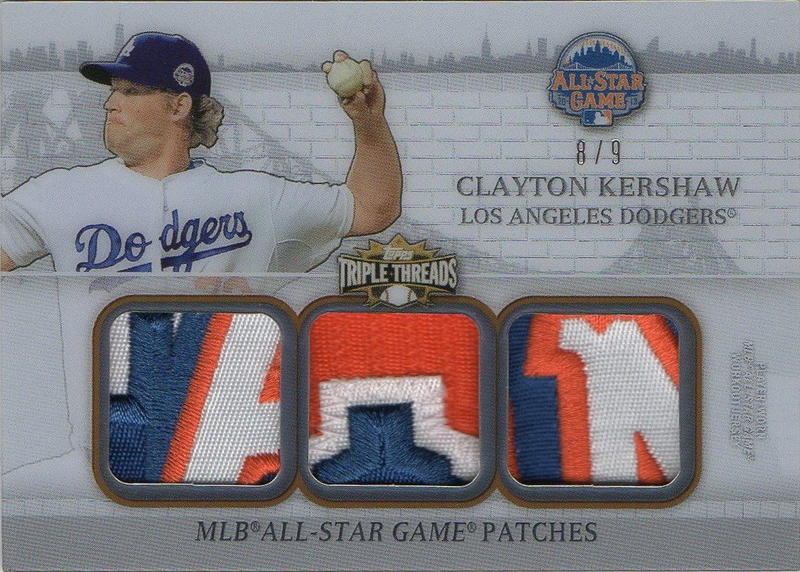 Below is the Kershaw All-Star Laundry Tag Patches Booklet card. 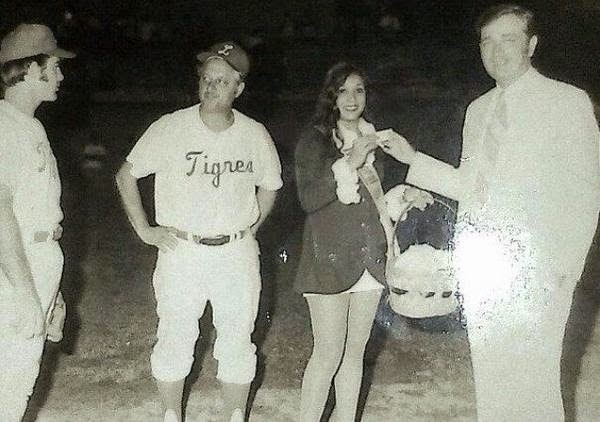 I just love this photo tweeted out by @Dodger_History on twitter of a less-rotund Tommy Lasorda and Steve Garvey playing winter ball in the Dominican Republic. BTW, the showdown with the Giants begins tonight in San Francisco. Hyun-Jin Ryu faces off against Madison Bumgarner at 7:15 tonight. What is this all about? Via AP on FoxSports, "Man charged with allegedly smuggling Dodgers' Puig from Cuba." I'd be willing to bet that this has been a huge distraction. Via Harold Uhlman at Think Blue LA, "Lookouts fall behind 2-0 in Southern League Finals." The Dodgers AA famclub is on the brink of elimination. Via JP Hoornstra at the Inland Valley Daily Bulletin, "Dodgers’ Dee Gordon embraces change, is stealing bases with his feet." “It’s about safety and being able to (steal a base) in the long-term, and being called safe more,” he said. In July 2012, Gordon dislocated his thumb sliding head-first into third base in a game against the Cincinnati Reds. Since then, he’s managed to avoided any serious hand injuries by wearing a protective guard. He tried switching to a foot-first slide multiple times since, but the change never took until recently. Ow! Watch this with caution. Via David Brown at Big League Stew, "Marlins' Giancarlo Stanton hit in face with pitch and taken to hospital." Via Daniel Brim at Dodger Digest, "Jamey Wright, Lefty Specialist?" Sometimes I get emails from other collectors hoping I can help them fill a wantlist. Well, the other day I got an interesting one that I thought I would pass along. A collector named Scott is in the process of collecting tickets from every game that Mike Piazza has played in, and is in need of tickets from his days as a Dodger, from 1992 to 1998. If you have tickets from this era (preferably a season ticket holder from that time) that you'd be interested in parting with please let me know. I'll hook you up with Scott.